Our weekly vegetarian meal plans are 5-day menus that serve a family of 4 — or less if you don’t mind leftovers! Click on each of the meal links below to get printable recipes. 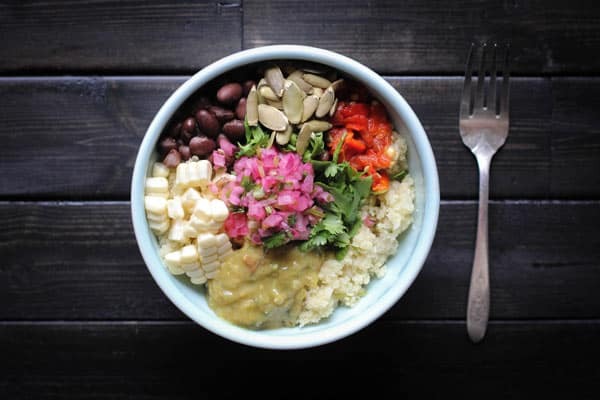 Mexican Cauliflower Rice Salad // This incredibly flavorful salad is even better as leftovers—you could even make an extra batch to set aside for lunches throughout the week! 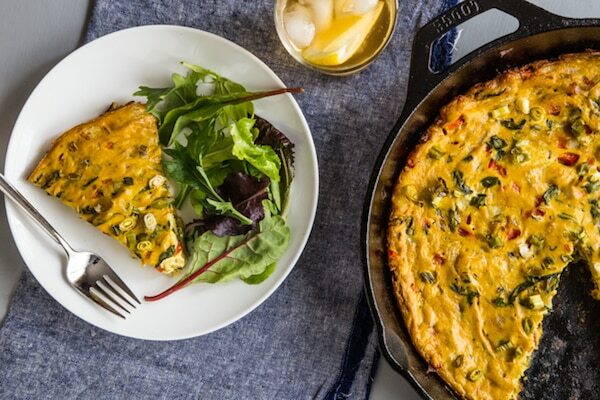 Tofu Frittata with Spinach and Peppers // No eggs required for this frittata! If you have leftovers, set them aside for breakfast or lunch on Wednesday. 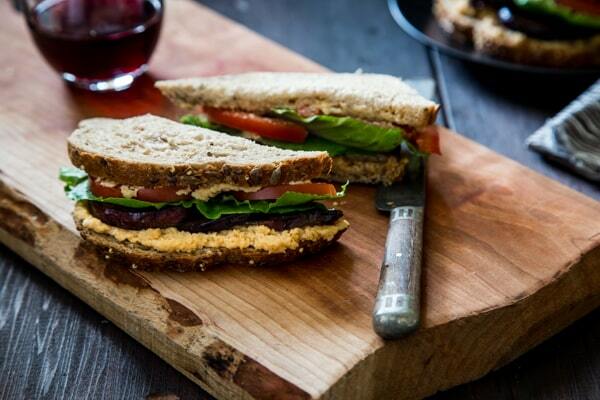 Vegan BLTs with Eggplant Bacon // A spicy Sriracha cashew mayo nicely complements the smoky eggplant. This is the perfect sandwich to use up all those extra tomatoes, eggplants and greens! 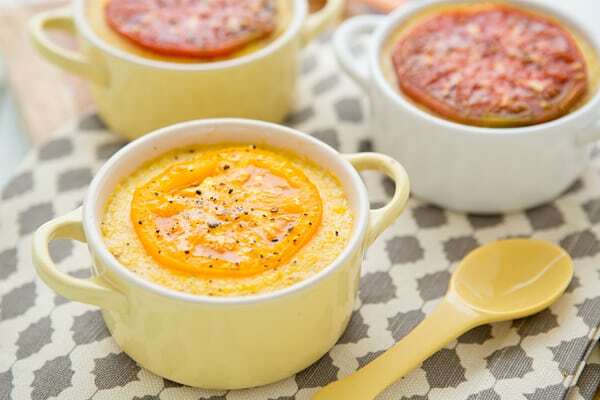 Smoked Cheddar Grits with Heirloom Tomatoes // You don’t have to be Southern to love grits. Broiled heirloom tomatoes (which should be plentiful this time of year) add some acidity to this cheesy dish. Serve with a small side salad, baked beans or roasted veggies. 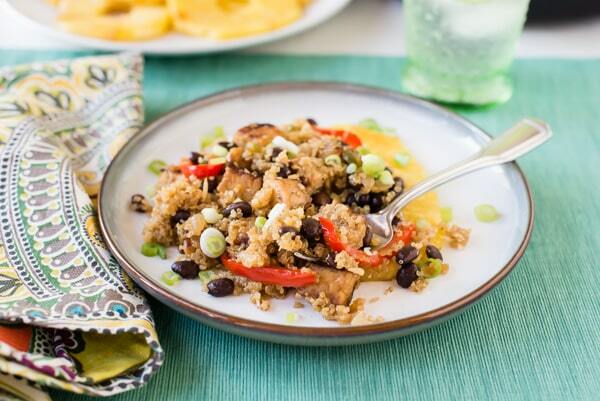 Cuban Fried Quinoa with Black Beans and Smoky Tempeh // End the week on a savory, smoky, Caribbean note with this vegetarian take on Cuban fried rice. You’ll likely have leftover Sriracha cashew mayo, so freeze it or keep it in the fridge to use on other dishes. You could also skip making the cashew mayo and use vegan or regular mayo mixed with Sriracha to save time. Mix up the greens in the frittata to use whatever is available at the supermarket or in your CSA box. You may need to quickly sauté tougher greens like kale, though. Dana Raidt is a Minneapolis-based writer and editor with a passion for music, a penchant for thrift-store shopping and a never-ending recipe repertoire. As always, a great meal plan. I have been using this site as a meal planning resource for a couple months now and I am so grateful.